I’m rarely glad to see a Monday morning arrive, but after this weekend, I’m willing to make an exception. Over the weekend, two stories took center stage. Stories that are sure to enter into the classroom this morning and will present teachers with a unique challenge in how they are addressed. The first is a local tragedy, while the second involves the next chapter in our country’s ongoing conversation about race and inequality. On Sunday morning, gunfire erupted in a small church in Southeast Nashville. One person was killed and 6 more wounded before a heroic member of the congregation, Caleb Engle, was able to disarm and subdue the assailant. Among the wounded was long time educator Joey Spann and his wife. It is hard to process an incident of this magnitude. A house of worship should always be a place of sanctuary and safety. Unfortunately, the list of places where we can expect to be free of violence grows shorter and shorter. Please keep the victims and their families in your prayers. Also on Sunday, in response to President Trump’s attack on football players who chose to take a knee during the playing of the National Anthem, 204 NFL players took a knee. 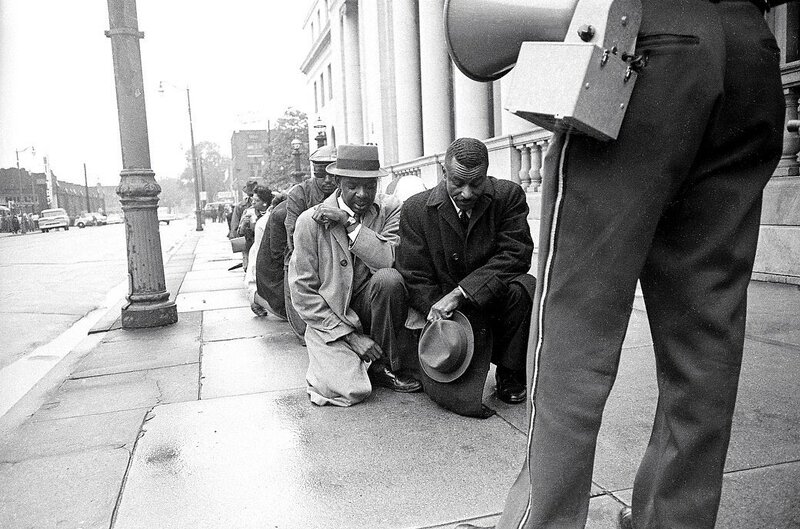 The taking of a knee is a symbolic gesture designed to draw attention to the racial inequality currently embedded in American society. Many of these athletes are heroes of our children. Therefore, I’m sure their actions are resonating with our students, evoking many emotions and questions. I suspect they will come into the classroom with those questions and emotions in an effort to seek counsel from adults they trust. I spent a great deal of time on Sunday engaged in social media conversations on both the gesture and what it represents. There are good points brought up on both sides, and while I went to bed on Sunday short on solutions, I was long on things to think about. These are conversations we cannot shy away from. The inconvenient truth for my generation is that we had our shot. We did what we could to find solutions. In some areas, things got better, and in others, not so much. Now it’s the next generation’s turn to lead, and we should empower them to do so. The next round of solutions will come from the kids who are sitting in our classrooms today. We owe it to them to share our experiences, while not imposing our will, in a manner that will empower them to seek solutions that will move the ball farther down the field. We often speak of the importance of critical thinking. 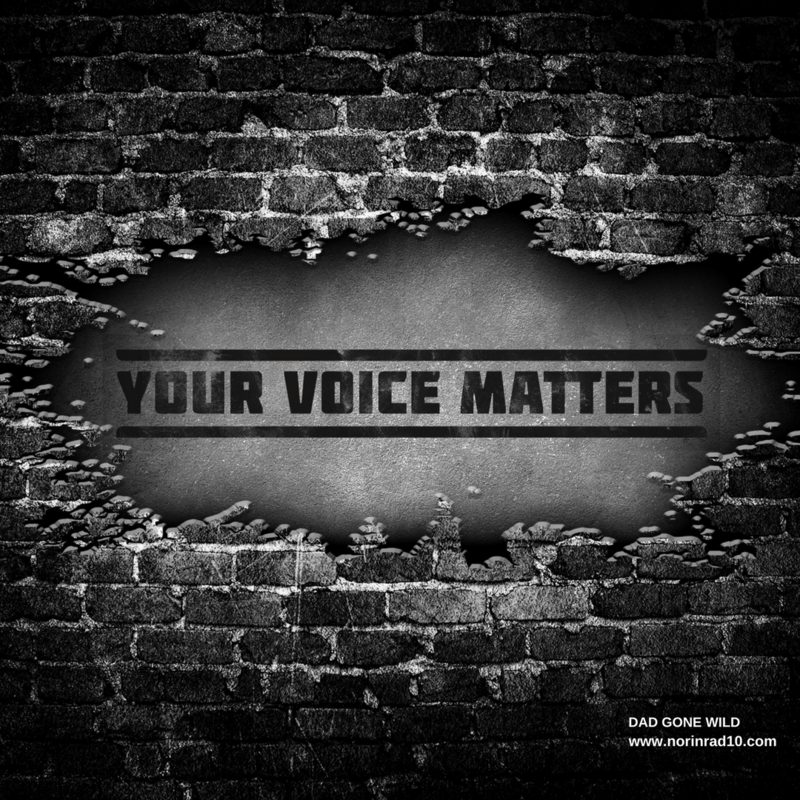 Now is the time to put our money where our mouth is because out of critical thinking arises the ability to have difficult conversations in order to challenge established beliefs – ours, as well as other’s. Conversations that my generation has often sought to ignore. Personally, I believe there are many ways to honor our country and demonstrate that love of country. Challenging your country to be the best that it can be is every bit as respectful as standing during the national anthem with your hand over your heart. Too often we use the shade of patriotism to shield us from addressing inequalities that affect our fellow citizens in a negative manner. Honoring your country should be a daily occurrence lest we, to co-opt a popular church saying, become a man looking for repentance for what he did yesterday and what he plans to do tomorrow. A state law was passed last spring requiring school districts to share student directory information with charter schools. Certain elements at MNPS are not-so-secretly hoping that this is all going to end up in court. Which, if you couple this with the other 5 lawsuits facing MNPS, you might get legal service at a discount. I’m not trying to be facetious, and I’ve been slow to comment on those other lawsuits because of their gravity, but I continue to feel we’ve got more important issues that require our focus rather than fighting with the state over data that, if you’ve ever been on Facebook, is readily available. 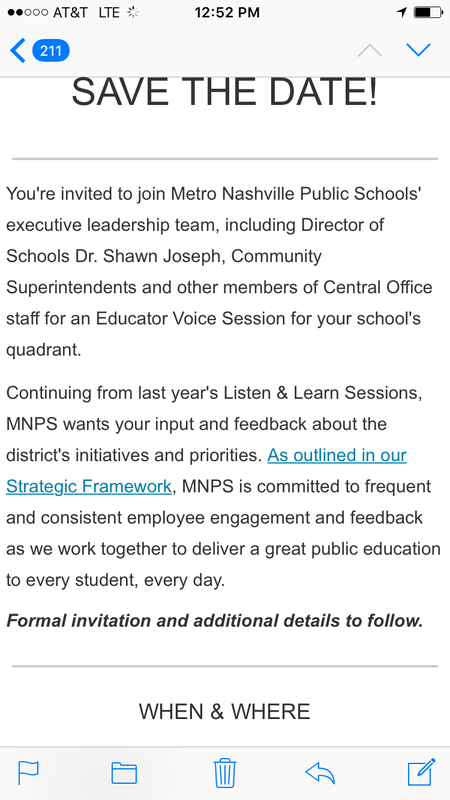 Good news MNPS teachers, Director of Schools Shawn Joseph will see you now. 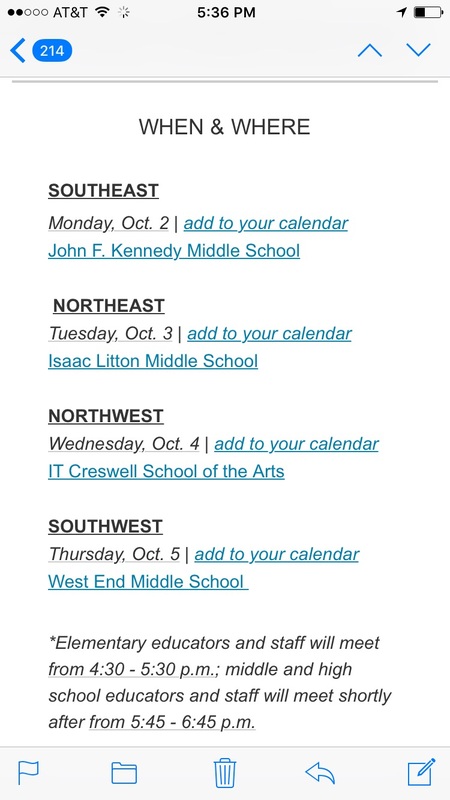 A series of “Educator Voice” sessions have been scheduled for the first week of October. One will be held in each quadrant. Sounds great, huh? But I’ve been thinking about this over the weekend, and I’d like to make some observations if I may. My biggest question is who is going to attend these shindigs? Most of the teachers I’m in contact with are so covered up with trying not to drown that they would probably schedule a root canal before they entertained the thought of getting in their car during the last week of the first quarter, during rush hour, to drive across town to a meeting that may or may not have tangible results. If I’m a high school teacher, I would have 2 1/2 hours to kill after school ended in order to attend said meeting. At least the root canal would have a definitive tangible result. Beyond the question of “What teachers are going to show up?” is the question of “What will they say when they get there?” It’s no secret that the district suffers from a lack of trust on all levels and that very little has been done to counter that situation. People don’t tend to give honest answers when they don’t trust you. It’s easier to take the path of least resistance and just smile, nod, and say, “I’m fine.” What is the impetus for teachers to make the trek and share their true thoughts? Why would a teacher risk potential backlash or, even worse, no reaction, by speaking about their true observations? The cynic in me believes that district leadership knows this and is counting on it. These meetings are just checking the box. Low turn out and less than honest feedback will allow them to go before the board the following week and say, “We’ve met with teachers and we’ve got challenges but the majority support what we are doing. We plan to continue this dialogue.” The board will smile, nod, and commend Dr. Joseph on his transparency and the presentation of a wonderful report. Meanwhile, teachers will continue to try and survive, let alone thrive, under less than optimal conditions. Unless of course, that doesn’t happen. If the sessions are well attended and teachers speak honestly on the challenges they are facing, it would be tough to ignore them. By presenting a united front, teachers could make it very difficult to spin their story. But then again, maybe the stories I hear are just representative of a small sample size. Maybe things are really better than ever. Maybe the district really is setting up teachers for success. Maybe job satisfaction is at an all-time high. Maybe all that is needed is a few tweaks. I don’t know. I’m not a teacher and those are stories only teachers can tell. Channel 5’s Phil Williams will be doing another follow-up report tonight at 10pm on elevated levels of lead in drinking water. Please keep in mind while watching that 15 ppb is the actionable number, not the safe level. What is safe to say is that we continue to expose those who have the most to risk. There will be an informal meeting of what was once the Overton Cluster Parent Advisory Committee today at the Tusculum ES library at 6pm. 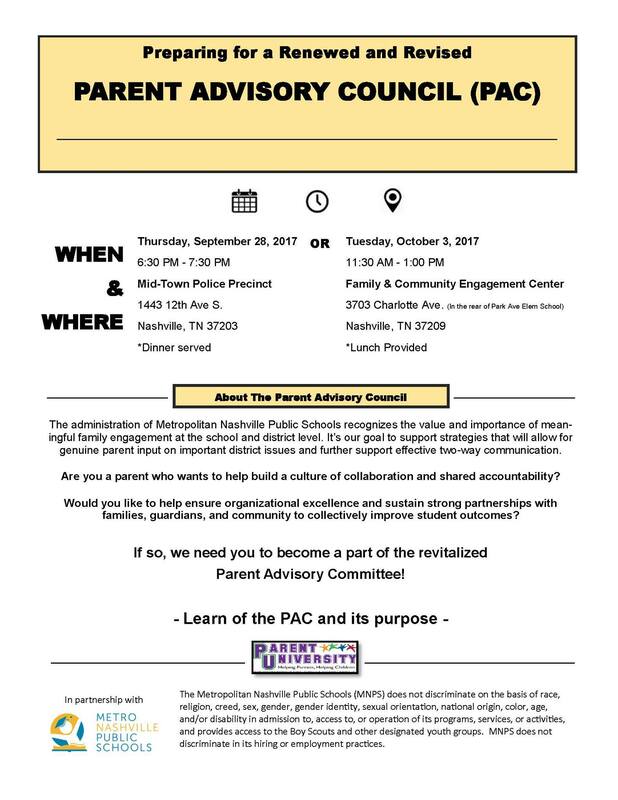 The purpose of the PAC is to explore methods to make the Overton cluster even stronger and to serve as a vehicle for parents to find answers to their questions. MNPS is formally re-establishing the PAC later this week. Tonight’s meeting is in anticipation of that formal construction and to help parents have a greater understanding of how they can make a difference. Hopefully, all who can attend will. Congratulations also goes out to Overton High School for having the highest graduation rate in the district. Remember that “blue-ribbon Transition Team” that met at the beginning of last year? Well, apparently one prominent member may be transitioning himself, as the Baltimore Sun reports that former Baltimore Director of Schools Dallas Dance is currently under investigation. Apparently there are questions surrounding Dance and an outside company that did business with the Baltimore School District. Diane Ravitch has even more insight into Dance, and I urge you to read the comments as well as the article itself. Here is your agenda for the MNPS board meeting on Tuesday September 26th. There are a couple of things to look at on the consent portion of the agenda that don’t have further explanation. There are a number of legal settlements needing approval, as well as proposed contracts with Education Based Services and Blackboard Inc. that probably should have come with a little more information. 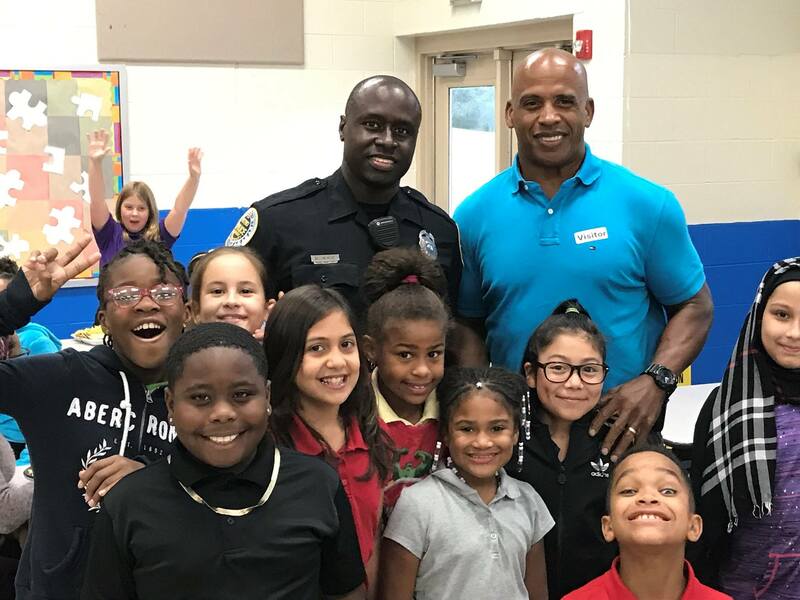 Henry Maxwell Elementary School recently honored their neighborhood first responders by inviting them to have lunch with students. Attendees included members of the police department, fire department, EMTs, and active duty military. Hats off to these dedicated servants. Former Eakin Principal Tim Drinkwine is traveling the world with his family this year. You can keep up with their travels via his blog. Follow it and you won’t be sorry. I happen to agree with all the top answers. TVASS is junk science and to use it to evaluate educators and schools is just wrong. By the same token, it is the law of the land, and this administration’s inability to produce even marginal success stories after 13 months should cause some concern. At some point you have to take the rules of the game you are given and produce. I’m not afraid of evaluation, but can we get some transparency? Question 2 asked for opinions on MNPS’s discipline policy, and the answers here are a bit concerning. The number one answer with 38% of the responses is that discipline is worse than ever this year. An additional 31% responded that the policy seems to translate to “don’t suspend children of color.” Twenty-five percent indicated that there was little change. Only 5% acknowledged things were improving. In my humble opinion, the concept of “Restorative Justice” garners universal approval. Many speak to its transcendent qualities. Virtually everyone agrees that suspending fewer kids is important. Unfortunately children of color have borne the negative impact of past discipline policies and are suspended at higher rates. The need for change is recognized, but it’s the implementation and lack of adequate supports where the policy loses support. I’ve heard many teachers express their frustration and, in some cases, their concern for their physical safety due to the shortcomings of our discipline policy. I’ve long said adjustments need to be made. Interestingly enough, there were no write-in answers to this question. The last question asked for your opinion on allowing schools to be governed by anything but an elected body. Sixty percent of you thought this was a terrible idea. The second leading answer with 17% was “It can’t lead to a worse board than we have now.” I’ll refrain from commenting on that one and allow y’all to draw your own inferences. As for an appointed board, I think that option could produce catastrophic outcomes. Look at the proposed board in Chattanooga. It would be 7 members, with 4 appointed by the state and 3 appointed by the district. Hmmm… wonder how all those votes will come out? The current method at times produces less than stellar governing bodies, but representative governing bodies nonetheless. It also allows for a method for citizens to voice their dissatisfaction. Every couple of years you get a chance to head to the polls and change the make-up of the current board. I firmly believe that’s a right that should be fiercely guarded. Ugh. Can we get a more narcissistic board? That does it for this update. I’m sure I missed a few things. As always, check out the Dad Gone Wild Facebook page and you can contact me at norinrad10@yahoo.com. Thank you for all you do. Previous OF GOATS, PLAYGROUNDS, TVAAS, AND POLLS. Next NO. THE WATER AT MNPS SCHOOLS IS NOT SAFE. My opinion as a classroom teacher is that Restorative Justice just equals “a good talking to.” That is, students who disobey teachers and are disruptive in the classroom get no more than a “talking to.” I am a classroom teacher. I have no idea who talks to students and what kind of discipline students get. It takes more work for an MNPS teacher to write an office referral these days. We have to go through steps that include calling parents. This in itself will cut down on the number of office referrals. As I said. I am a classroom teacher and I have no idea what restorative justice involves. From what I can see, there is no justice restored to the teacher.